Annual El Camino & Chevelle Show!!! The spirit of success could not be as readily realized without the generosity of our sponsors who help us year after year. To help make a show such as this successful, it takes a lot of hard work, time, and yes, money! That is why we ask for support from our sponsors such as you, to help make it enjoyable for all that come to the show. Once again we could use your help with a CASH donation to help defray the cost of trophies and door prize items. We are a small non-profit organization and basically pay for each annual show using the sponsor donations that we receive from giving people like yourself. That is why our success goes hand in hand with the generosity of our sponsors year after year! Any and all help you can provide is greatly appreciated by all of us in the El Camino Classics Club. FOR CASH DONATIONS, we are using an improved format: $50, $100 and $150 donations are gladly accepted, and will be honored with your name/business on an award. YOUR CASH DONATION OF $200 or more will be rewarded with a “Thank You” plaque! The Sponsor’s names will be displayed on our Annual Show Flyers & Posters, your Business logo and website will be added to the El Camino Classics’ website in our sponsorship section. Additionally, your Business Name will be engraved on the awards and will be announced as the award is being presented. WITH A CASH DONATION OF $300 OR MORE, the Sponsor’s name will be printed on the Annual Show T-Shirts, logo on Flyers & Posters, and your Business logo and website will be added to our Club’s El Camino Classics website in our sponsorship section. Additionally, your Business Name will be engraved on the awards and will be announced as the award is being presented. If you would like to take part in the award presentation, please let us know in advance. All sponsors are encouraged to be at the show and present the award if desired. We also encourage sponsors to display Flyers or Banners. 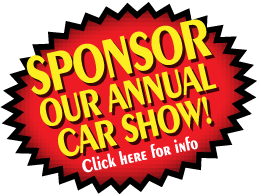 This year, Sponsor booth space is available to display and advertise your product at the show for a minimum of $50 Donation per space. EL CAMINO & CHEVELLE Show. Contact a club member if further information is needed. Or Gary Countryman at 425-355-1037. To download a PDF of this information that also has suggested items that you can donate along with your CASH donation and a form to fill out and send your sponsorship to us CLICK HERE.